We are excited to announce that Chronicles of Humanity is now available on Amazon! 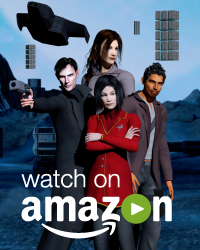 You can now buy, rent or watch free through Amazon Prime, the movie edits of season 1-3 and Redemption. Previously these have only been taken to special screening events and not available for general viewing. Redemption’s movie edit was created specially for this and has never been seen before! These edits combine every episode from each season and turn them into feature length films. Titles and credit sequences have been edited out, additional scenes created when the episodes didn’t quite mesh together. It’s a smoother viewing experience with more content, you’ll get to see the story unfold all at once. It also helps the show as it will fund future episodes and gives something back to the cast and crew who have spent so much time making the series happen. As the series creator, I feel very strongly about this. I made the created the show but I couldn’t have done it without everyone else involved and I want to make sure they get something for it. You can find the movie edits all here, along with an FAQ at the bottom of the page which should answer your questions (if it doesn’t, send them in). Why should I buy the movie edits when the episodes are free to watch? How come Uprising isn’t available on Amazon.com? It seems to have gotten stuck during the approval process. It’s being investigated and should be available soon. Why aren’t the films available in my region? Unfortunately, Amazon’s streaming video services are not available everywhere. As of right now, they are only available through Amazon.com, Amazon.co.uk, Amazon.de and Amazon.co.jp. However, as Amazon’s video service opens up in new territories, we’ll make the show available as soon as we can. Will the free episodes disappear? At the moment, I see no reason to take them offline, especially since Amazon video isn’t a global service yet.